LBA Logistics and RXR Realty are bringing a massive 770,000 SF multi-level logistics center to Maspeth, Queens, expanding the current 6.5 acre site at 56-19 Grand Avenue from its existing 71,000 SF warehouse which is currently leasing with occupancy Q2 2019. The Port Authority has approved $335 million of additions to the $10 billion JFK International Airport revamp. The changes include a rehabbing one of the busiest runways, Runway 13L and 13R, as well as adding a new taxiway for planes to help alleviate runway congestion. Jasper Venture Group has completed an important step in the delayed conversion of the decaying Parkway Hospital in Forest Hills, Queens. The developer entered the project, 350 market-rate rental apartments, into New York City’s Uniform Land Use Review Procedure (ULURP) for public review. The hospital was closed in 2008 after a prolonged legal battle, and it was shortly picked up by Jasper Venture Group at auction. Original plans by the developer for condos fell through and attempts at selling the property were unsuccessful. Since 2016, they have been working with local officials to convert the site into affordable housing. The group plans to add two stories to the existing six-story structure and build 135 market-rate apartments, including senior housing. It also wants to build an additional 216 apartments in a 14-story tower on the property. The first step in the public review process is the local community board and the Queens Borough President; then proposal will be reviewed by the City Planning Commission, followed by the City Council, and the Mayor. AKI Development has launched leasing at The Nordic, their new luxury boutique rental building featuring 9 apartments. The art programmed project features a collaboration with Sweden-based muralist Tony “Rubin” Sjöman, whom AKI Development worked with to create a selection of murals throughout the project. Developers Simon Baron Development and Quadrum Global have officially announced the launch of leasing at ALTA LIC, a soaring new porcelain and glass tower in the thriving Queens Plaza neighborhood of Long Island City, Queens. The Durst Organization has released new renderings of 10 Halletts Point, the new 405 unit rental building which will be the first to open at the 7 building Halletts Point megaproject in Astoria. Designed by Dattner Architects, 10 Halletts Point features studios, 1, 2, and 3 bedroom apartments spread over 2 towers. JDS Development Group teamed up with the award-winning CetraRuddy Architecture to build Saltmeadow, a 60 apartment/townhome rental community in the tranquil beachside neighborhood of Far Rockaway, Queens. Construction has officially topped out on the TWA Hotel At JFK International Airport, one year after groundbreaking on December 15, 2016. The hotel breathes new life into the adjacent iconic, 1962 Eero Saarinen-designed TWA Flight Center, which will become the hotel's lobby and will feature an museum/ exhibition space open to the public. Sales are now underway at F&T Group's Tangram House South condominium project and the project is already reportedly nearly 50% sold. Tangram House South is the first phase of the 4-building megaproject which will bring 1.2 million SF of total development over 4 separate buildings in partnership with SCG America. New renderings have been revealed for the new residential project to be located at 32-65 107th Street in East Elmhurst, Queens. The project was first announced in 2015 and is under development by Qin Li of Triple 8 Real Properties. LeFrak has returned to its roots and revealed their new $70 million redesign of LeFrak City in Corona, Queens. The renovation takes their master-planned community that the company founded in 1962 to the next generation. A trendy new commercial building developed by Fernando Magalhaes and designed by Bluarch Architecture has been revealed at 40-17 28th Avenue in Astoria. The project will rise 3 stories, 49', and will feature 37,443 SF of total development with 7,113 SF of restaurant space and 7,131 SF of community space. Genting Group has broken ground on their 420,000 SF expansion to their Resorts World Casino New York City (July 2017). The five-star, 400-key resort is located at 110-00 Rockaway Boulevard in South Ozone Park in Queens. 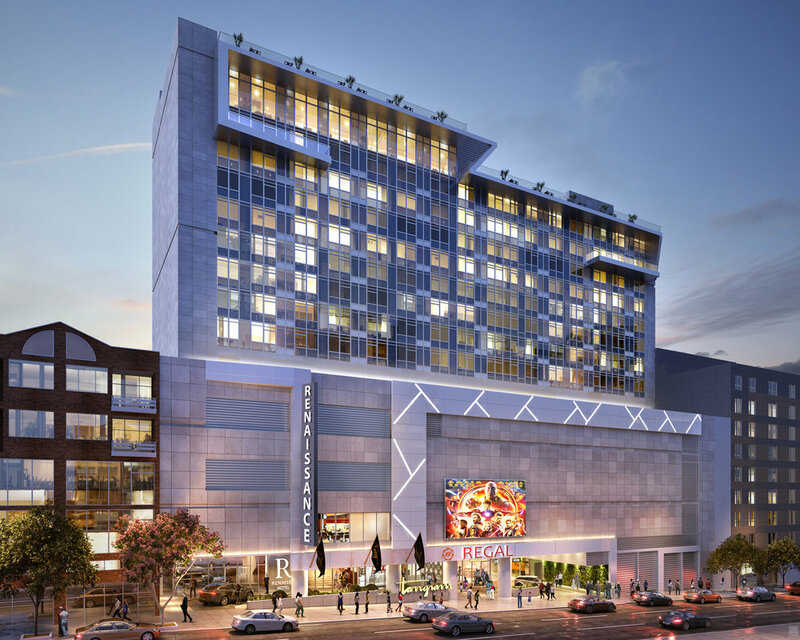 The project features the addition of new 10-story structure that houses 400 hotel rooms, retail, dining and entertainment including 1,000 new video lottery terminals. The expansion is expected to cost $400 million and will be completed in 2019.